The Govans area was established in 1775 when Frederick Calvert, the sixth and last Lord Baltimore, granted several hundred acres of land to William Govane. Govane named his estate Drumquastle (one of various spellings) after his father’s home in Scotland. By the 1840’s the property had shrunk to 27 acres, which contained a three story mansion and numerous outbuildings. It was demolished in 1948 and replaced by the Drumcastle Apartments and what is now Drumcastle Center. 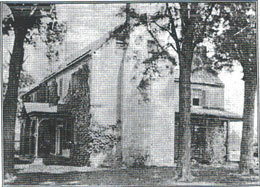 Located between Govanstown and the Drumquastle property was the large estate of James Edwin Myers, a Govane descendent. It is within the boundaries of this estate, which was known as Linden, that most of Lake Walker lies. In the late 19th century, a few streets were laid out and houses were built along parts of Walker and the top of Weidner, as well as along Ready, Nicoll and Cedarcroft (which was then called Linden Ave.). This latter area was known as Linden Heights. On Easter Sunday, 1902, the Linden farm house burned to the ground. The only remnants of this ample homestead are the stately oak trees near the intersection of Hollen and Clearspring, and this faded photograph. Later, in 1918, as the Baltimore City boundary moved northward to its present location ,the Myers estate was purchased by the Peabody Heights Company. This outfit, between the years 1922 and 1926, built approximately 166 of the two models of frame houses which line Hollen, Mayflower, Cedarcroft and Highwood, and named the development York Park. The Lake Walker Improvement (later changed to” Community”) Association materialized in 1976 when a number of homeowners were concerned about, and vehemently opposed to, the planned construction of an eleven-story apartment complex for the elderly on York Rd. to be known as Walker Mews. Through the tireless efforts of these residents, the project was nearly defeated, but finally was scaled down to five stories. And it was this well organized struggle, which led to the first general meeting, held that September at the Church of the Nativity, with the late Roland Vaillancourt of Gitting Ave. presiding as its first president. Dues were set at $3, and eight Block Captains were recruited (we now have 32) among whom was Joan Browne of Weidner Ave. who is still performing that service today.